I love cooking with my kids and I think it is rather fabulous way of spending some time together. I am absolutely delighted to have been asked to be one of three judges to judge this rather splendid bloggers cooking with kids competition. 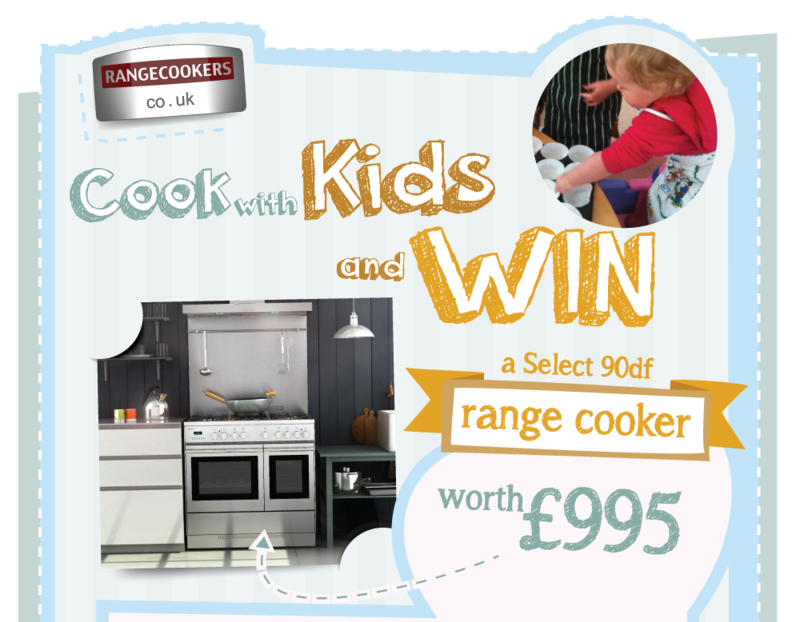 The prize is this pretty amazing range oven …..
All you need to do is simply – cook with your kids! Choose a dish to cook, the more fun and messier the better, and get creative with it, then blog about it and include some photos. Do take a look at Rangecookers competition page for the full details. Me and Lisi love to cook together. She is 5 and I am 41 and yet our skill levels are about the same. I know what I like to eat and what looks good but my baking is somewhat hit and miss. I am a bit slapdash with measurements and don’t always have all the ingredients in the house to make the food she wants to make . But we go for it anyway. Her enthusiasm and love of cooking makes it all worth while . Here she is making her famous chocolate chip cookies (well the neighbours and her great granny love them) Annalise likes to do it pretty much all by herself so I help with measuring and she pretty much does the rest. Her absolutely favourite part is licking the spoon clean! 1. Cream butter and sugar then beat in the egg. Add a few drops of vanilla essence too. 3. Stir in flour and chocolate chip chunks keep stirring till it makes a dough. 4. Place balls of dough (slightly flattened) on greased baking tray. This cooking session resulted in lots of mess on the floor and in her (refused to tie it up) hair but no one is bothered. The cookies as usual turn out lovely. But I’ don’t really care. It’s the fact she’s turned out SO LOVELY that I most care about. Straight away she wants to take one to our elderly neighbour who delights in her frequent baking., She wants to put one to one side for daddy and take some to her playdate as a gift. I am so proud of her sharing ways. I am proud to of the fierce independence she shows, her desire to learn new things, her persistence and how wonderful she is to spend time with. I love her so much. Cooking with your kids is fab. Disclosure: I receive compensationfor judging this competition. Previous Post Money management for when you have a little one on the way! I am on it – like a bonnet! ps. and Thank you – uber comp! Mum of One recently posted..Easter Craft: No-dye Spotty Easter Eggs. Four year old Grandson came down stairs at 3am in the morning where I found him with a bowl of eggs and flower. He said that he was making some buns. I really need to cook for my kids. They and I like a meat and potatos meal with a starter and dessert. Fab comp. My children & I would love to win!! Cookies look good enough to eat, amazing prize would love to try the cookie recipe using it. I love baking with my two daughters, a new cooker would be the icing on the cake. I love Chocolate Chip Cookies, even better when they are made for you! Excellent idea getting children involved in the cooking, will help them in the future. The sight of those cookies make me feel soooo hungry! Amazing prize. Love to win it! Cooking is everything. It pleases others, relaxes those who eat and cook, relieves stress for everyone and what’s more the food tastes truly delicious. Love cooking with my daughter, but need a reliable cooker. I need a cooker like this to bake some yummy cookies like yours ! Love cooking with the children even if it looks like a bomb has hit the kitchen. Great fun. Fab way to cook with your children. They look delicious! What a brilliant competition. I don’t like cooking, but perhaps a good oven would make a difference! Elaine Livingstone recently posted..The experiment that didn’t work – Why?